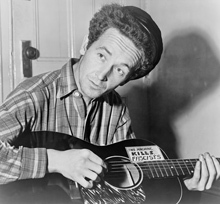 Woody Guthrie's widest claim to fame is surely as the composer of This Land Is Your Land. Wide as that claim may be, it is also shallow. Guthrie was a prolific lyricist, poet, composer, painter, sketch artist, journalist, correspodent, novelist, essayist, playwright and polemicist. He was a creator. If it involved a pen, paintbrush or pick, he did it. A lot. At the time of his death in 1967 he left behind thousands of pages of as-yet-unpublished work testifying to the ceaseless creativity that occupied him until Huntington's disease claimed a larger and larger share of his physical and mental faculties in his later years. Among the pages left behind were thousands of lyrics the music to which had either been lost or never existed. In 1995 Guthrie's daughter Nora approached an English singer-songwriter who, like her father, is best known for putting his music in the service of the working class and those the economy has left behind altogether, Billy Bragg. She offered Bragg the opportunity to set some of the lyrics to music and so introduce new Woody to a new generation. 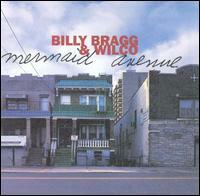 Bragg agreed and later invited his mates from the band Wilco to collaborate on the project. The result was Mermaid Avenue, released on Elekra Records in 1998 and followed two years later by a second volume of Guthrie's lyrics set to music. The project met with broad acclaim, garnering numerous nominations and awards and reviving interest in both the performers and Guthrie's legacy.